You can find the beginning of the ‘Land Art Forest’ in the ‘BiesBosch’, which means the forest of Bies (common club-rush). This area stands central for the land art, first as an example how we can give back and how we can recover nature. Second as this is the breeding ground for a lot of my thinking. The changing of this area over the years has been to say the least, dramatic. The area was created by St. Elizabeth’s flood of 1421. Due to war and the rush for profits the dykes were neglected therefor on 18 November 1421 the water broke through and the area became an inland sea/delta. Nature used the rivers to create land again with silt, bit by bit water became sandbank, sandbank became silt plate, silt plate became swamp with reed and rush and finally meadow. The BiesBosch became an important fishing area, in 1910 thousands of salmon were caught in a year, yet 23 years later the salmon fishery was finished due to overfishing. The same goes for the ‘Steur’ (sea Sturgeon) a big fish which was used for the caviar. In 1900 438 Steur were caught in the BiesBosch and in 1925 just 3. The land was used for hunting, there were several Duck decoys used to shoot Ducks in large numbers. This came also to an end and the income of the landowners came from the harvest of Willows and Rush, and cattle from the meadows. Even it was cultivated land it was rich in wildlife due to the swampy character and the dangers due to the tidal difference of 2 metres. A knowledge about the area was needed to wander around. The best way to visit was by canoe all them small creeks with growth all over it due to neglect as the market for Willow and Rush had dropped thanks to the cheap plastic, which is still today cheaper than Willow. It looked like a jungle in my childhood memories with lots of birds and filled with adventures. All this came to an abrupt end when the Haringvliet was closed to protect Holland from the sea and to stop flooding from happening again. A flood once created the BiesBosch now flood-prevention killed the BiesBosch. There was only 20 centimetre difference between low and high water, the water became still and dead. Botulism moved in and many birds and fish died and several people were infected. Straight after the dam came the reservoirs for water, 3 big concrete basins to store water. Not that we didn’t have enough rain but because the rivers became too polluted to give safe drinking water for the big city of Rotterdam. A nature area of a total of 693 hectares (1712 acres) of land came under concrete basins filled with water in 1973. 3 Years later biologist from the TU Delft gave a public speech about how it should be different this was for me the turning point perhaps better a starting point that we can and should do it different. Nature and culture can go together, you don’t need to make a choice. While i spread my wings to discover the world and study, the fight for the BiesBosch went on. The result is fantastic. In the seventies a big turning point was created by them environmentalist which many of us have forgotten. GreenPeace and the Friends of the Earth made a big impact on decisions and companies had to stop pumping their poison into the rivers. Slowly the rivers became cleaner, we still have a long way to go but progress is made. 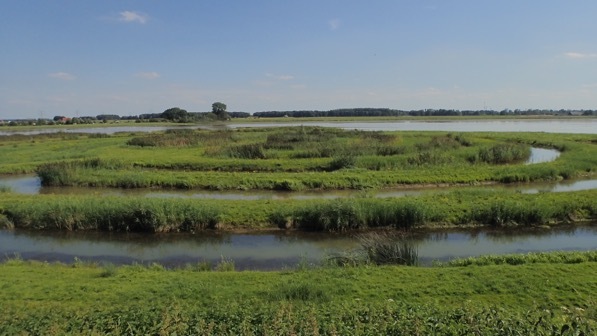 Clean rivers bring better water quality to the BiesBosch and better land management created new nature. It didn’t stop there, people started to care more and more, so the politics started to change according very slowly, as politics always do moves slowly. The people at the BieBosch however didn’t sit still and waited, they worked hard to create changes to reintroduce wildlife back into the area. 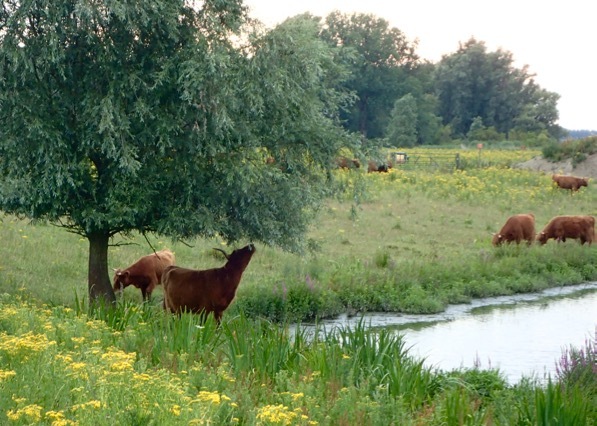 The BiesBosch became a National Park in 1994 many land parcels were given back to nature. It is back to a delta were rivers can overflow preventing floods elsewhere, showing how nature can help. Climate change brings more and heavier rain to our land, don’t forget around two/thirds of the land in the Netherlands is under sea level. Once they wanted to get rid of the Willows now they are a respected part of the landscape. 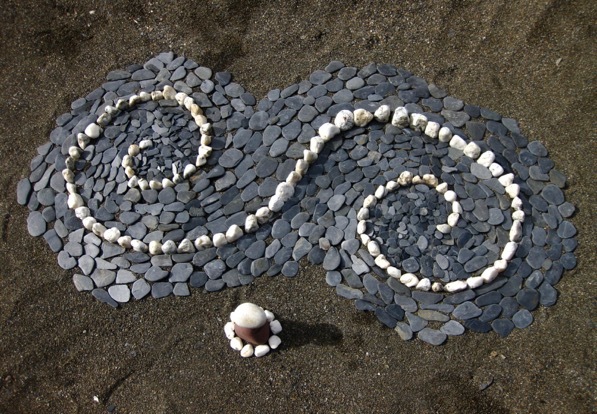 Land Art is a part of this nature regeneration where culture meets nature and shakes hands. The Moon Spiral made by land artist Paul de Kort, a brilliant piece to walk and enter nature, proves this. There are more plans to give land back to nature to change agriculture land into nature. 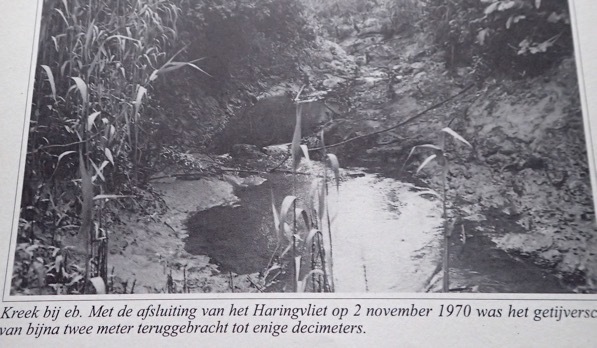 It doesn’t even stop there, the dam at the Haringvliet will be opened permanently to let the fish back in. It took politics 14 years to finally realise that this is a good idea. In the meantime the Sea Sturgeon has been reintroduced into the rivers after more than 65 years they swim perhaps back into the BiesBosch. It just shows so clearly, that we can make a difference and that a long fight do give results, we can give back to nature and enjoying it. When we help nature we help ourselves. 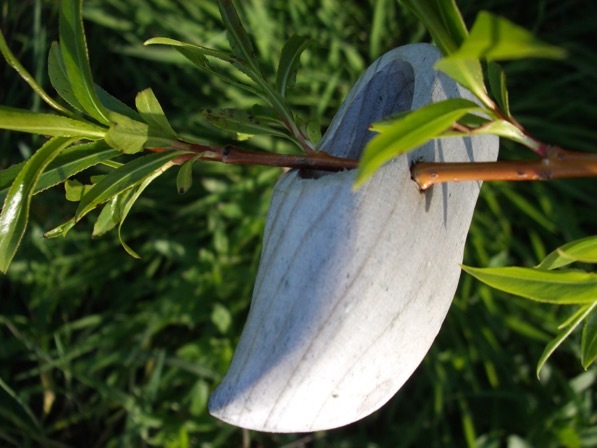 On the moment the Land Art Forest is just in her baby shoes, not much more than a creative idea. It will be a hard battle to see how a group of people can own it and how we can prevent it from being sold ever. For now I am looking for people who like to be involved and who want to help. In the next series of blocks you can read about the lessons learned from other Land Art projects i did. The Land Art Forest will benefit from all them lessons. The blog will be written in English next to this a book will be written in Dutch. 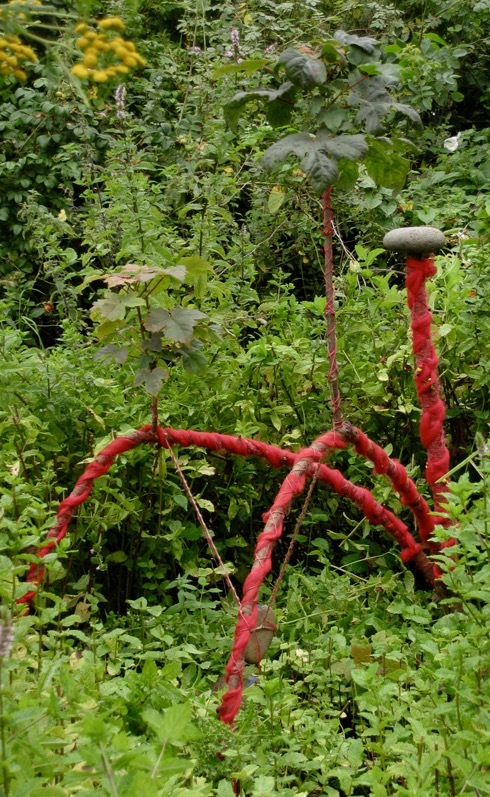 The idea is that people can use this to create their own Land Art Forest where ever they are in the world. For now the focus is on a Land Art Forest in Portugal and in Holland. 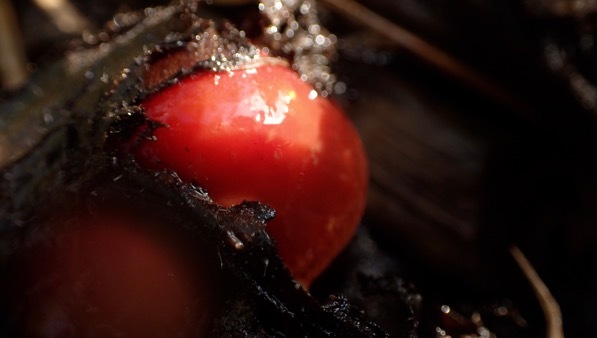 Both forests will have to deal with extreme weathers and both will be used to regenerate nature by people themselves. In the end the blog will share lots of information about products that will help, together with which trees can be planted best. The photos will always be related to LandArt, documenting that vanishing moment in LandArt. It comes as no surprise to go from a photo back into LandArt. The organisers of the exhibition ask me to give a talk about my work at Clegyr Boia in Wales. How can a drop relate to 6 hectare of land, perhaps the feeling of really being just a drop in the oceaan while you know you should be so much more than a drop. The little feed the big and the big feed the little, we forget, we give up before we start, feeling so little among the so big. 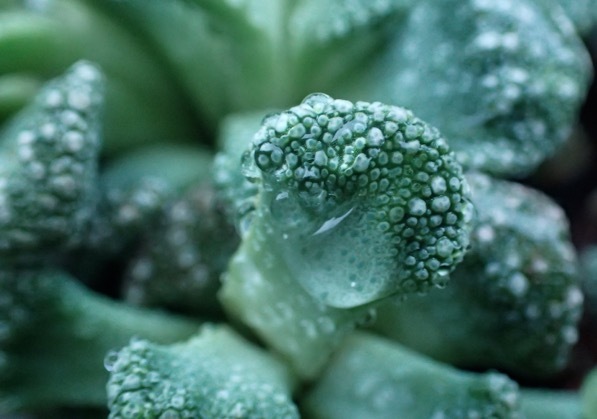 All them little drops form an oceaan, without a drop no oceaan. Remember, many little create a big. LandArt alters the landscape, sometimes just a moment, sometimes forever. The artists have a dialoog with nature in a landscape and from that dialoog flows a sculpture which alters that landscape. They add something to the landscape or they intervene in the landscape or they act in the landscape. The LandArt at Clegyr Boia became a landscape. The lessons learned there on that plot of land act as a basis for the next piece of LandArt. A concept that will be used for several pieces of LandArt, all around the world. So the photo exhibition will be the onset for something much bigger than a drop in the oceaan. Trees will play a major role as they always play a major role in so many different landscapes. Trees are the backbone of a landscape. Learning from past mistakes, learning from past failures, moving into achievement. A book will be written about the experience at Clegyr Boia with at the end how to move them experiences into an achievable LandArt Forest. The notebooks came out of the cupboard, photos are searched and gathered an idea takes shape. Research starts, into books, newspapers and internet to make the idea grow. While writing about the past contacts are made for a network of people and organisations to add onto that base of a forest. New notebooks come into action and in November there will be more than just a drop in the oceaan. The exhibition has been moved to November 2018 at Alcoutim in Portugal.